To start off our food trail around Penang Georgetown, we decided to focus on eating places that are strongly recommended by other penang food and travel blogs and are located within walking distance from our hotel – Hotel Jen Penang. 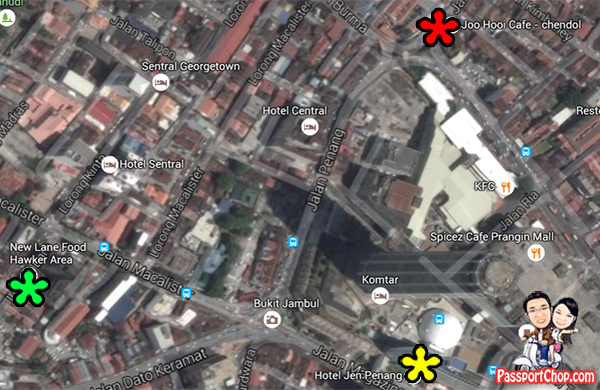 From Hotel Jen Penang (marked by the yellow star in the map below), our first destination – New Lane Hawker Centre (marked by the green star) is only 6 minutes walk away. 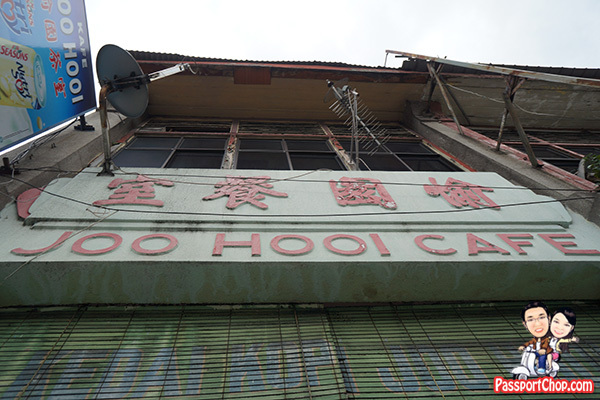 Joo Hooi Cafe (red star) is even nearer – just behind Prangin Mall so you get some shelter in your walk towards the famous Penang Chendol (cendol). See Part 2 of our Penang Food Trail with Bangkok Lane Mee Goreng and delicious Char Kway Teow here. 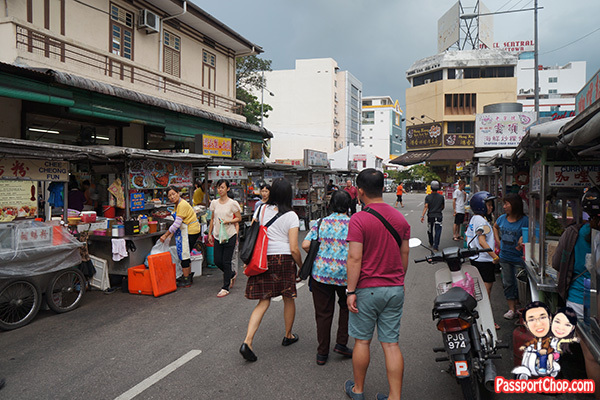 We started with New Lane Hawker Centre along Lorong Baru, Georgetown which is a 6-minute walk from Hotel Jen Penang. Do note that the definition of “hawker centre” in the case of New Lane Hawker Centre is quite different from what we understand as hawker centre in Singapore. As you can see in the picture below, most of the food stalls are located on pushcarts outside of the indoor eating place – you order from one of these pushcarts and they will deliver your orders to your table. The tables are not numbered but you can reference to stalls near your table and the hawker will usually know where to go. We started our Penang food journey with Hokkien Mee. 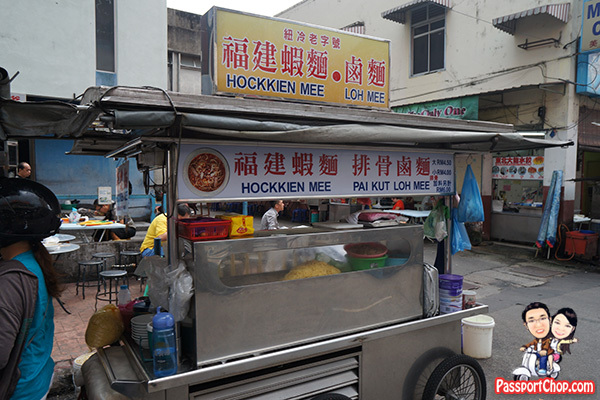 Do note that the Hokkien Mee here is different from the Kuala Lumpur Hokkien Mee which is the dry black mee – the Hokkien Mee in Penang is what we in Singapore will call Prawn Noodles (or Har Mee). Penang Hokkien Mee consists of egg noodles and rice noodles stir-fried with egg, slices of pork, prawns and squid, garnished with vegetables, small pieces of lard served with chili sauce on a spoon (so you can adjust the spiciness accordingly). 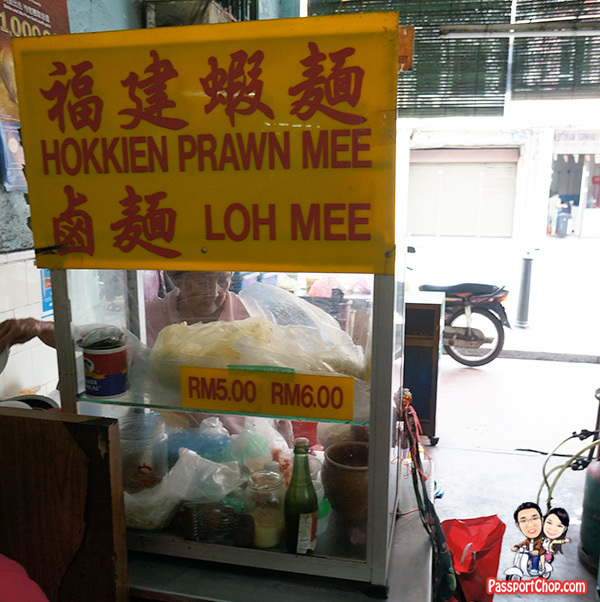 We got our Penang Hokkien Mee (or Har Mee) from this roadside pushcart stall at New Lane Hawker Centre. You can order the small Hokkien Mee for RM4 or large bowl for RM4.50 (just S$1.50! based on 1 SGD to RM3 exchange rate). We ordered the small bowl but yet the serving size is quite generous – smells and tastes very good. 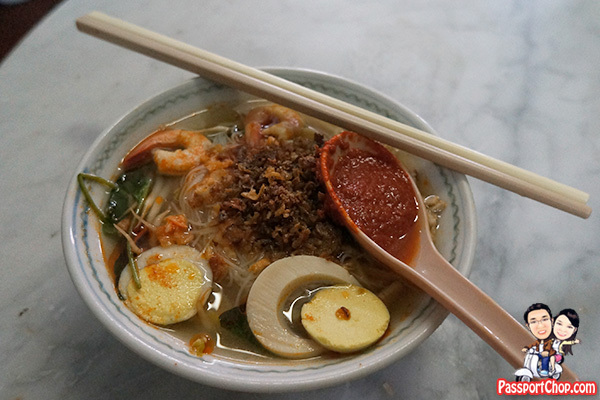 The prawn soup base is very well done and tasty and the noodles are well cooked. I strongly recommend the Hokkien Mee from this stall in New Lane Hawker Centre. Next, we tried the Curry Mee. 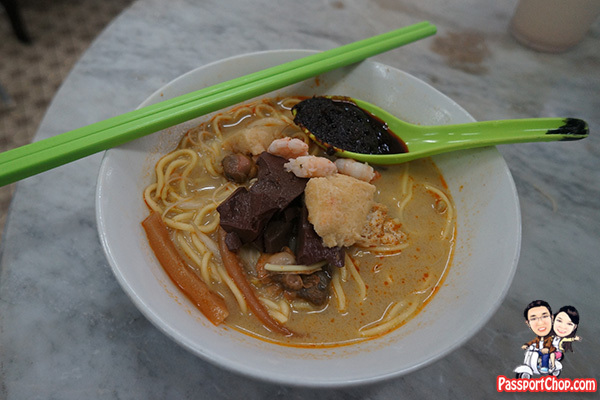 Make no mistake – Curry Mee is not Laksa – they taste very different. Curry Mee is made up of thin yellow noodles and string thin bee hoon (rice vermicelli) with spicy curry soup, chili, coconut milk and quite a few other ingredients e.g. cuttlefish, prawns, eggs. Our curry mee from the above pushcart stall at New Lane Hawker Centre is also sold at RM4 (small Curry Mee) or RM4.50 (large bowl) or if you want more ingredients (RM5). 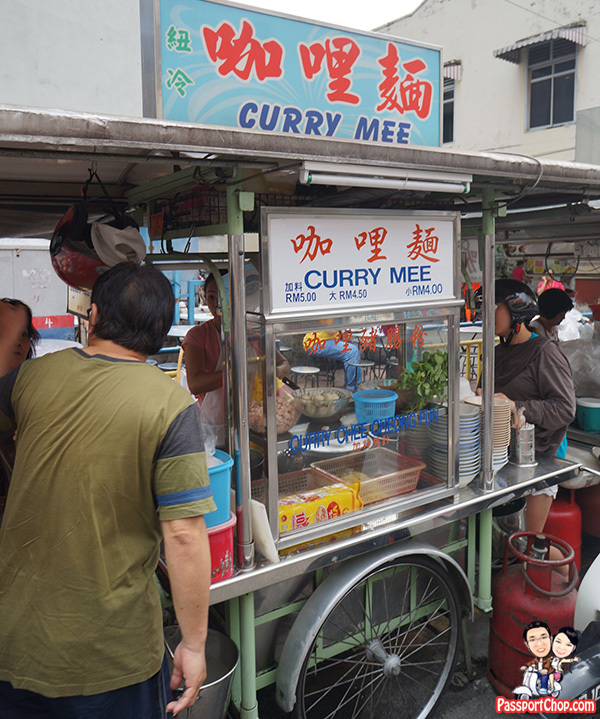 This curry mee stall is located just beside the Hokkien mee stall. Our RM4 small Curry Mee is also very generous in serving size. The curry is quite flavorful and not very spicy (you can adjust the spiciness by dipping more of the chili into the curry and stirring it). There are lots of pieces of pig’s blood cubes (the dark cubes you see in the picture below – pig’s blood cubes are banned in Singapore so if you want to savour this delicacy, this is the place to do so), cockles, tofu and cuttlefish. I also recommend the Curry Mee from this New Lane Hawker Centre stall for the affordable price, generous serving size (not just noodles but also the ingredients) and the flavourfulness of the curry. Some reviews I read online said that New Lane Hawker Centre has become a tourist trap and prices are getting more expensive e.g. char kway teow which comes in small portions and cost RM7. However, I find that prices are quite reasonable (at least for the Hokkien Mee and Curry Mee that we tried) and the food is quite good. There is also a wide variety of food available at New Lane Hawker Centre – from char kway teow to hokkien mee to apom – pretty much all the food that Penang is famous for. Do note that as with almost all coffee shops/eating places in Penang, you are expected to order drinks if you dine in at their place or you will be charged RM1 per person. If you bring in ice kacang, cendol, dessert & beverages from outside, you will also be charged RM1 per item – well, at least they allow outside food – there are no additional charges for bringing in hokkien mee, curry mee and other food. The New Lane Hakwer Centre is open from 5pm to 12 midnight Monday, Tuesday, Thursday to Sunday – New Lane Hawker Centre is closed on Wednesdays. Most stalls will be opened by around 5.30pm. 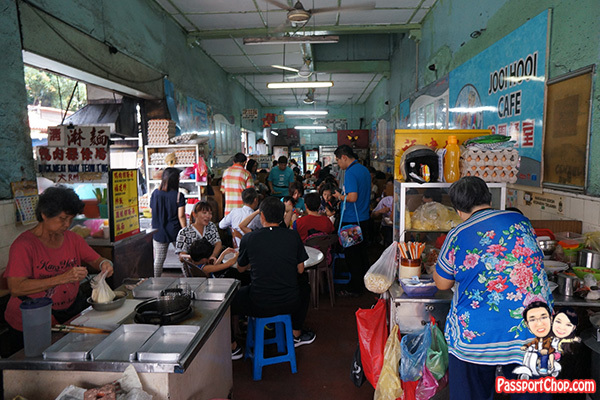 There is a very famous teochew chendol stall in Penang – it is located at an alley called Lebuh Keng Kwee just off the main road of Jalan Penang. 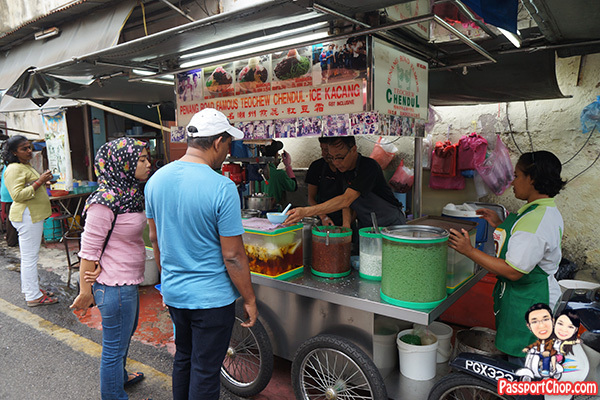 Do note that there is another cendol and ice kacang stall just opposite the famous chendol stall. 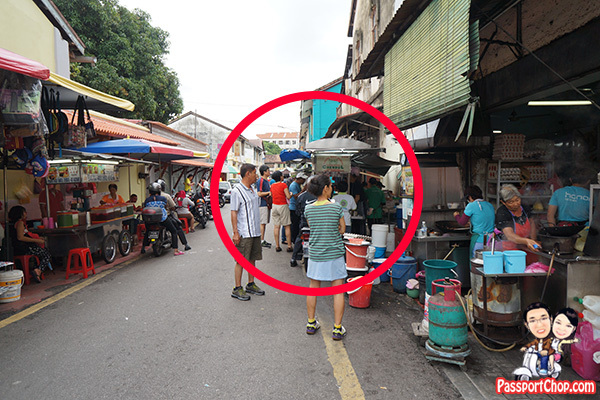 So when you turn into Lebuh Keng Kwee, note that the famous chendol stall is on your right (see the red circled stall in the picture below). You can’t miss it because there will always be a queue for the famous Penang chendol. On weekends lunchtime, the queues will be much much longer so avoid if you can and come early before lunchtime. … this is what their rival stall at the opposite side looks like. I didn’t try the chendol and ice kacang from this rival stall (which also boasts to be the Penang Road Famous Chendol based on their stall signage) so I can’t say for sure which is better but if you want the chendol that everyone talks about, then go to the chendol stall on the right side of the alley as you walk in. 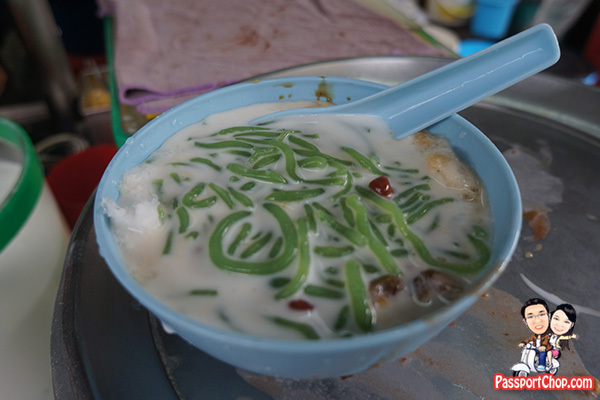 The picture below shows what the chendol (RM2) from the famous Jalan Penang chendol stall looks like. 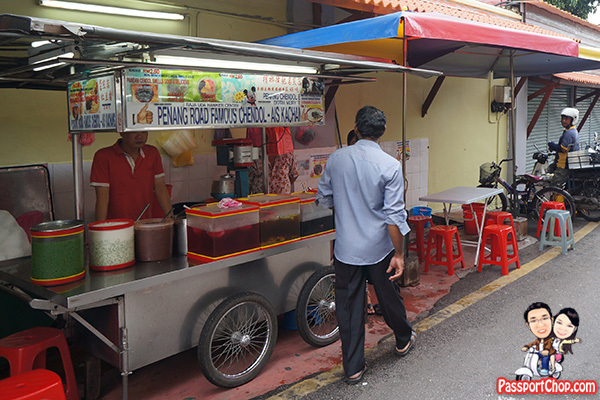 I didn’t find the Jalan Penang chendol very amazing – not quite worth all the hype and long queues. There isn’t a lot of ingredients in the chendol – just a lot of ice and brown sugar making it quite sweet and milky. There is no place to sit to enjoy your chendol so most people will stand around the stall to eat their chendol. The opposite stall will not allow you to use their table and chairs for obvious reasons. You have an alternative i.e. to sit inside Joo Hooi cafe but do note that you will be charged an additonal RM0.50 if you bring your chendol (from either stall) to eat in Joo Hooi cafe – this is even when you have ordered food from stalls in the Joo Hooi Cafe. I guess that is because the chendol is competing with beverage sales in the Cafe but at least they allow you to bring your chendol in. Joo Hooi Cafe is a coffeeshop just beside the Penang Chendol – there are a few stalls inside Joo Hooi Cafe e.g. charkway teow, hokkien mee, assam laksa etc. so it is a one stop if you want to try the best of penang food. Find yourself a seat and order direct from the stall owners – they will bring the food to you and you pay them when they delivered their food. 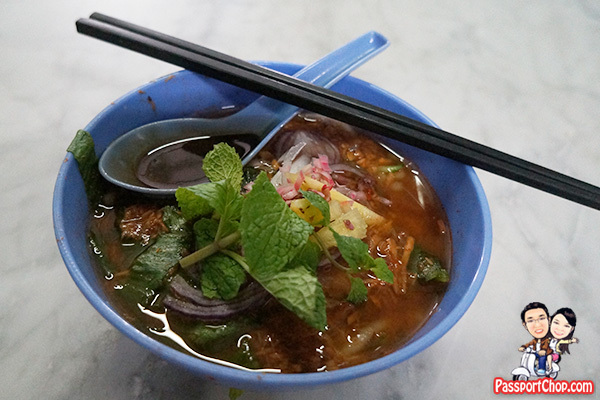 We tried the Assam Laksa at Joo Hooi Cafe. Assam Laksa is made with mackerel soup and its main feature is the assam (or tamarind) which gives the soup a sour taste. The fish is poached and then flaked. Other ingredients that give the Penang assam laksa ts distinctive flavour include lemongrass, galangal and chili. We ordered a small bowl of assam laksa for RM4.50 – larger bowl cost RM5. 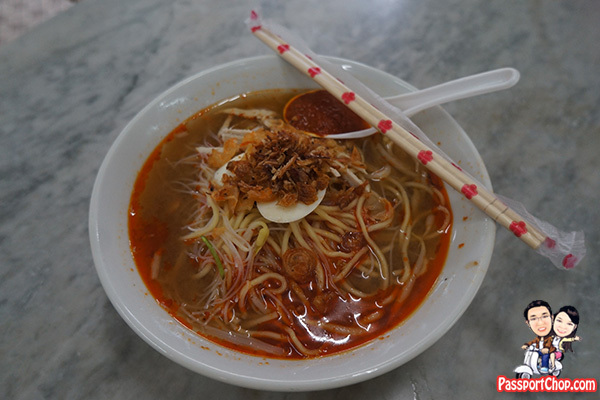 I have tried a number of assam laksa in Singapore and Penang before – they are usually too sour for my liking but this bowl of Assam Laksa sold at Joo Hooi Cafe was just perfect in terms of sourness and very flavorful. This is our second Hokkien Mee tasting in Penang and I have to say the Hokkien Mee at Joo Hooi Cafe did not disappoint me. Sold at RM5 for small and RM6 for large bowl of Hokkien Mee, the Hokkien Mee sold here is slightly more expensive than other stalls around Penang. This is the serving size for RM5 bowl of Hokkien Mee – quite generous servings – very flavourful and yummy. Highly recommended by me. The hidden gem for Joo Hooi Cafe has to be the Kueh Pie Tee. 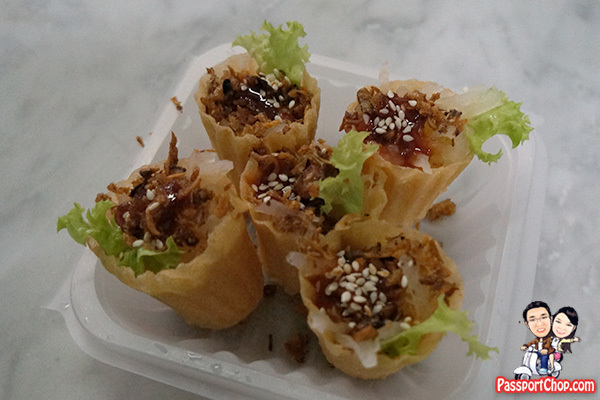 Pie Tee is a popular Peranakan Nyonya dish and is made of crispy pastry tart shell kuih filled with a spicy, sweet mixture of thinly sliced vegetables and prawns. It cost just RM6 for 5 Pie Tees (just about S$0.40 per piece) – very worth it. This is a must try when you are here at Joo Hooi Cafe besides the assam laksa and Hokkien Mee. 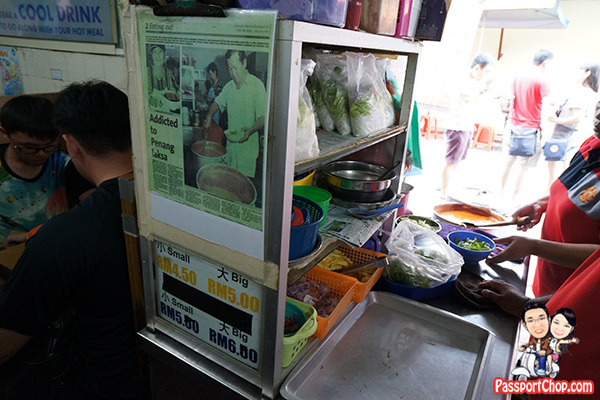 We didn’t try the char kway teow at Joo Hooi Cafe – there are a lot of newspaper clippings publicising it as one of the best char kway teow in Penang plastered all over the stall – it is always crowded with orders so be prepared to wait for your plate of char kway teow from Joo Hooi Cafe. There are so much food to try here in Penang – in our next blog post, we will wander further from our hotel to try the a few good char kway teow in Penang and discover hidden gems at Padang Brown Food Centre.